When I first started teaching fifth grade, I was seriously bummed about the lack of seasonal activities and centers for upper elementary. It was pretty much limited to writing prompts and crossword puzzles/word searches. When I started making my own resources, I knew that seasonal centers and activities were a must. Upper elementary students can definitely have just as much (if not more!) Halloween fun as the younger students. 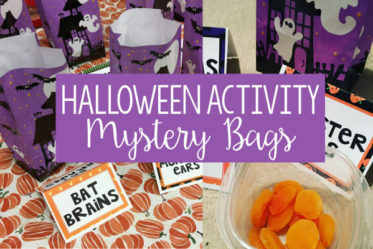 Here are some of my favorite Halloween activities and student treats for the Halloween season. One activity that is definitely a staple in my classroom is the use of math centers. We do math centers two to three days a week during Math Workshop and the students just love them. I always love putting Halloween activities in the math centers the month of October. These featured math centers are from my Halloween Math Centers resource that can be found in my store. There are centers for 4th and 5th grade skills which helps meet the needs of all of my students since it is still so early in the school year. 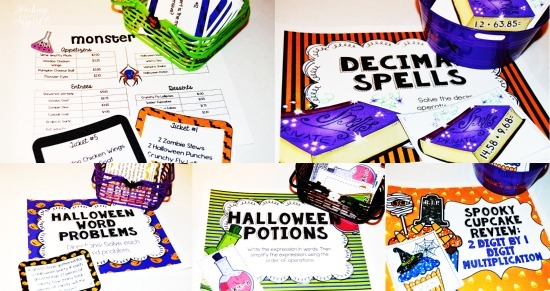 Click here to see the Halloween Math Centers in my TeachersPayTeachers store. Another recent favorite resource of mine has to be my Differentiated Math Tasks. Once I created my non-seasonal set (with a chocolate theme!) for fractions, I knew I wanted more. I have started creating these tasks for each holiday. Level 1 is the simpler level (perfect for 4th grade or struggling 5th graders) and level 2 is the more difficult level (perfect for 5th graders, advanced 4th graders, or struggling 6th graders). Another option is to use them both with your class. Sometimes I complete level 2 as a class and the students complete level 1 for independent work or homework. Click here to see the Halloween Differentiated Math Tasks in my TeachersPayTeachers store. I also have lots of themed math printables in my Just Print Math Packs for Grades 4 and Grades 5. These resources are the best! Cute, no prep, common core aligned, and the students love them. These can be colored in for a quick student work display also. Click here to see the Halloween Just Print Math Packs in my TeachersPayTeachers store. 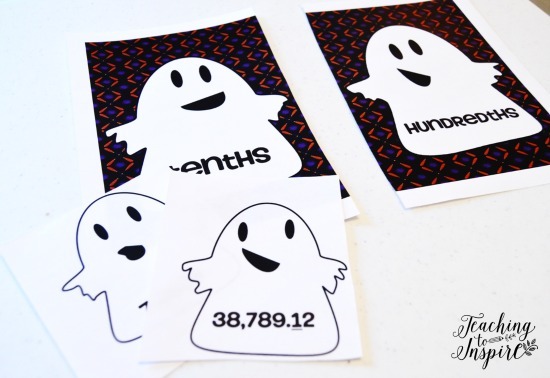 For a FREE Halloween themed math activity, I love this decimal place value review with not-so-spooky ghosts. Click here to grab the free math activity in my TpT store. I have blogged about these two activities, but I wanted to include them here again. We love making candy corn catapults and then exploring the scientific method with dissolving pumpkins. Click here for more information on the candy corn catapult and to download the freebies. I use a Writing Workshop format for writing instruction, but I still like to use seasonal prompts. The students love them, too. I have seasonal writing prompts for each major holiday in all three writing genres. Sometimes I use all three and sometimes I pull out a specific genre that I want the students to practice. My writing prompts are available in a few formats but my students love the task card format the best. They grab the card they want and a genre specific themed planning sheet and they are ready to plan and write. When the finish and are ready to publish their writing, they grab a themed publishing paper (also included in this pack) and complete their final draft. Click here to see the Halloween Writing Prompts in my TeachersPayTeachers store. We do so much rigorous writing in fifth grade that I like to loosen the reigns from time to time with just a light, fun writing activity. This FREE Halloween opinion writing activity is perfect for a fun, engaging writing activity. Grab the Halloween writing free for FREE here. Just as much as my students love math centers, they also love language centers. We only do language centers once a week due to time constraints. Typically, we do my non-seasonal language task cards and my language roll and answer games, but I love to use seasonal language task cards, too. 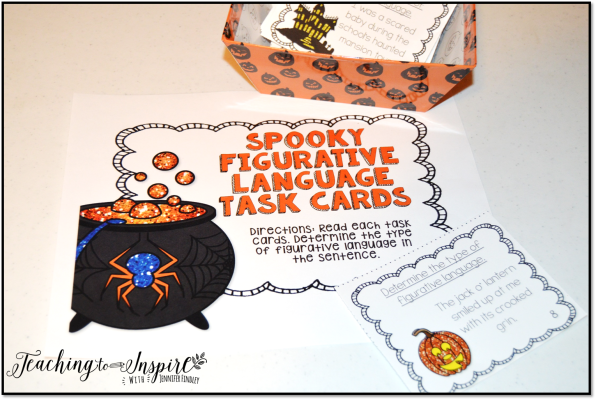 Click here to see the Halloween Language Task Cards in my TeachersPayTeachers store. The resource includes four sets of task cards that review figurative language, conjunctions, commas, and titles. Another engaging activity for Halloween is using Halloween themed graphics to review language skills such as parts of speech and figurative language. Click here to grab this engaging Halloween language freebie! Moving right on to reading, I love using my Just Print Seasonal Reading Packs. Each pack contains three texts (one informational, one poem, and one fiction) and lots of standards based printables and activities to go with them. The students love reading these high interest stories. I typically use these for homework during the month of October. 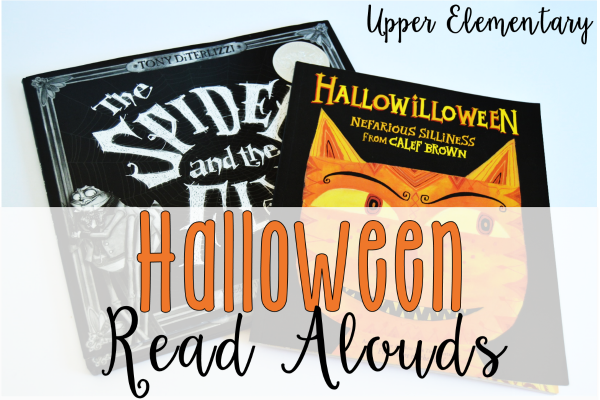 Click here to see the Halloween Just Print Reading Resource in my TeachersPayTeachers store. In addition to my Just Print Reading Resource, I also use Halloween Themed Paired Passages. This resource includes two themed and connected paired passages (four passages in all). Each set of passages comes in a traditional worksheet format and in an interactive notebook format. The students love the interactive notebook version. I use these sets in Guided Reading the week before and during Halloween; one set a week. 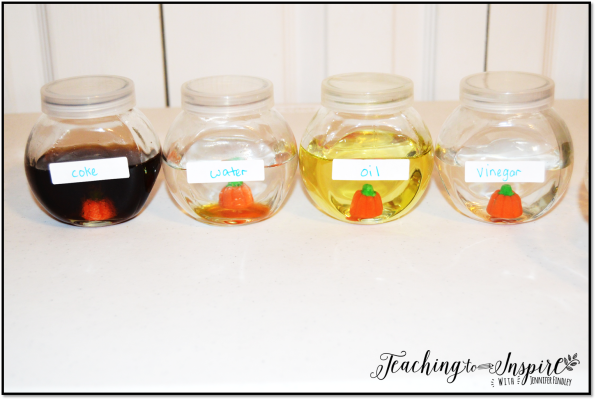 Click here to see the Halloween Paired Passages in my TeachersPayTeachers store. Of course, I cannot forget about Halloween read alouds. My students love read alouds but they really love holiday themed ones. Click here to see my favorite Halloween picture books and grab free printables to use with the books. Now let’s talk Halloween Treats that are NOT candy- because let’s be real, those kids get enough candy! Here are a few options for treats that I have given out over the years. The homework pass is a total favorite every year. The popcorn is always popular, too. The “Here’s a Treat” card is pretty generic so you can give candy if you want. You could give the students an orange or tangerine and let them decorate it as shown below. Click here to grab the Halloween Treat Cards for FREE! In addition to the treats, I also love passing these Halloween bookmarks out at the beginning of the month. There are six different options so you have some choice or you can let the students choose. I printed them on colored cardstock but you could print them on white cardstock and let the students color them. Click here to grab the Halloween Bookmarks for FREE! And there you have it: my go-to resources to have a Halloween themed, but academic school month. What resources are your favorite? Let me know in the comments. Thank you so much! These are wonderful resources.